This week author, Melissa Abramovitz, joins us. Melissa, tell us a little about yourself. I grew up in San Diego and received my degree in psychology from the University of California, San Diego in 1976. I have always loved to write; in fact I had my first poetry published while I was in high school, but never imagined that I would be a professional writer. For a long time I wanted to be a doctor or a psychologist. But when my two children were small, I wanted to be a stay-at-home mom while having a part-time career, so I decided to enroll in the Institute of Children’s Literature course to hone my writing skills and learn how to market my work. I sold the very first magazine article I submitted to a publication, and thought WOW, this isn’t going to be so difficult. I was so wrong! Since then, I’ve gotten lots and lots (literally hundreds) of rejections, as most writers do. I’ve also published hundreds of magazine articles for all age groups, along with numerous poems, short stories, and educational books for children and teens, so along with the rejections has come many hard-earned successes. When my kids were growing up, writing was my part-time profession, sandwiched between being a homemaker, PTA and classroom volunteer, and hockey/basketball/volleyball/karate/music etc. mom. Now being a writer is full-time for me, and I stay very busy doing mostly nonfiction articles and books. I love every minute of it (well, not the rejections – sigh) and feel privileged to work at something I truly like doing. I also teach some teleclasses for the Working Writer’s Club. 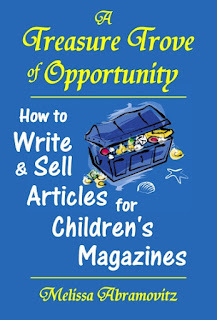 My recent publications include a children’s picture book, “The ABCs of Health and Safety” (Guardian Angel Publishing), and a book for writers, “A Treasure Trove of Opportunity: How to Write and Sell Articles for Children’s Magazines” (E and E Publishing). In the near future, I have several new educational book titles and magazine articles coming out, plus I have another picture book under contract with Guardian Angel Publishing. Tell us more about your two recent releases, ABC’s of Health and Safety and Treasure Trove. Lots of people think nonfiction is boring and dry, but good nonfiction writers actually use many of the same techniques fiction writers use for bringing a story to life. My main goal in writing nonfiction, which comprises the majority of my work, is to make learning fun, and I’m told I accomplish this goal in ABC’s of Health and Safety and in Treasure Trove. In ABC’s I use rhyming stanzas to make learning about health and safety fun for kids, and the delightful illustrations by illustrator Alexander Morris do much to advance this process. In Treasure Trove, I use examples and anecdotes based on personal experience and on the wisdom of numerous successful writers and editors to help bring the process of planning, researching, writing, and marketing children’s nonfiction to life for my readers. This book contains everything anyone could ever want or need to know about writing magazine nonfiction for young people. From the reviews and comments I’ve received, it seems that such a comprehensive guide was much-needed, and I’m glad to have filled this need. I read a lot of children’s books to keep up with what’s out there, and always find many I enjoy. As far as just-for-fun reading, I like popular novels by David Baldacci, Mary Higgins Clark, Robin Cook, Nicholas Sparks, and a few others. I’d have to say that my recent favorites are Stone Cold and Divine Justice (both by David Baldacci) and Marker (Robin Cook). I have written my first novel, for which I am seeking an agent, and have taken much inspiration from the works of these authors. I especially like the well-developed characters and exciting plots they always deliver. Many writers cringe when I mention that I love the work of these popular novelists, but I like what I like. I’m not going to pretend to like the supposedly high-quality literary works that I find boring and weird. I think the 3 most important skills for aspiring writers to hone fall under the umbrella of being professional in your writing and marketing. If you want to be a professional writer, you must act in a professional manner with respect to your 1. writing, 2. marketing, and 3. interpersonal skills. That means taking the time to hone your research, grammar and revision skills. It means only submitting error-free manuscripts. It means politely approaching or querying editors, and it means forging positive ongoing professional relationships with editors and publishers. It means being willing to revise your work so it meets an editor’s needs. It means studying market guides and reading a publisher’s books or magazines so you know what types of material they publish. And it means accepting the fact that all writers, no matter how experienced, get rejections. So accept these rejections, learn from them, and don’t give up, or you can’t succeed. My favorite things to do when I’m not working are spending time with my children and grandchildren, reading, and volunteering at my local SPCA (I’m a dog lover and animal rights activist). Great advice, Melissa. Where can our readers go to keep up with you and your writing? Thank you for joining us on Three Times A Charm, this week. I’ve thoroughly enjoyed hosting you on SoT. Hope you visit again. Best of luck with your writing, Melissa. Hi Kai, Really nice interview. Lots of good info. and advice from Melissa. Thanks for sharing. Glad you could stop in. It's always nice learning more about authors, isn't it? Very interesting and informative interview Kai. And Melissa, I love the covers on both your books. They are so kid friendly. Congratulations!! Thanks, Margot. I love chatting with people in children's publishing! Gee, Melissa, even though you teach workshops for us at the Working Writer's Club - http://www.workingwritersclub.com - I didn't know you grew up in San Diego. I lived there when I was a senior in high school and a freshman in college and I go back to visit friends there whenever I can. I love your Treasure Trove book. 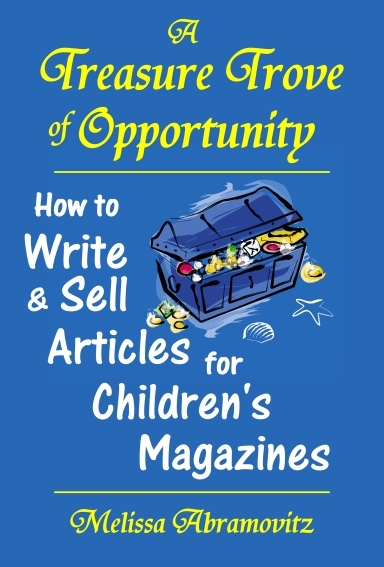 What a wonderful resource for people who want to write for children's magazines! Thanks for the interview, Kai! It's always fun to learn more about other authors! Suzanne, I'm so glad you could stop in. I see you everywhere on the internet, it's nice to see you here too! Great interview Kai. Congrats, on three times a charm Melissa. You deserve the recognition. ABC's of health and safety is a wonderful book for children. Thanks for reading and commenting, Susan. Great interview ad ditto all that positive feedback listed above. Can't add more than that. Ha ha, thank you Linda! This was such an informative interview. I love finding out more about other writers and how they work. Thanks! I do too, Sharon. There is always story behind the story, huh? Great interview! Interesting , informative and inspiring. Congrats Melissa and Nice work Kai. I really enjoyed that interview, thanks Kai. Melissa, you sound a real go-getter, such people deserve sucess. Good luck finding an agent for the novel. Thanks, Liam. Glad you could stop in! Margo, I love to hear what authors read for pleasure, too! Thanks for visiting. So nice to get to know you better, Melissa! Kai, thanks for posting this lovely interview. Glad you stopped in, Nancy. Kai, thanks for the interesting interview. Melissa, thanks for sharing about your life, your interests, and your books.